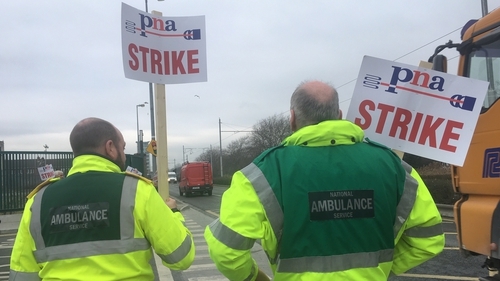 Ambulance personnel belonging to the Psychiatric Nurses Association are to hold two further days of strike action next month over union recognition and representation rights. Traditionally, frontline ambulance personnel were mainly represented by SIPTU. However, since 2010 up to 500 workers have defected to the National Ambulance Service Representative Association (NASRA), which is affiliated to the PNA. The HSE has refused to recognise NASRA or the PNA for negotiating purposes within ambulance grades, arguing that to do so would impair good industrial relations and lead to fragmentation. It has also ceased collecting and remitting union subscriptions of relevant ambulance personnel to the PNA through the payroll system - a service which it continues to provide for other unions. PNA members have already held four 12-hour stoppages on 22 January, 15 and 28 February, as well as 1 March - though contingency cover was provided. Today the union announced there will be two further strikes next Tuesday, 2 April and on Wednesday, 10 April from 7am to 5pm. In addition, the PNA ambulance members will hold a protest outside Leinster House tomorrow afternoon. PNA General Secretary Peter Hughes said ambulance personnel members were determined to secure the fundamental right to organise and be represented by the union of their choice. He claimed the NASRA branch now represents "more members by far than at least one of the two unions recognised by the HSE for frontline paramedics". He said it was unacceptable that the HSE was continuing to attempt to ignore and frustrate the wishes of these frontline staff to be members of the PNA. He accused the HSE of making no effort to resolve the dispute, despite statements from Health Minister Simon Harris and other Oireachtas members that the issues should be resolved through the Workplace Relations Commission and consultation. He urged the HSE to accede to the minister's request. The HSE has said it is fully committed to maintaining positive industrial relations with all staff. It said it is not appropriate for employers to recognise break-away unions adding that such a move has destabilising effects on good industrial relations. In a statement it said the "principle of engaging only with recognised trade unions has been acknowledged previously by the Labour Court in a dispute involving the PNA and a different public-sector employer. "With this in mind, National Ambulance Service will stand by the agreements that it has made with recognised unions and will not undermine those agreements by engaging with other associations or unions. "This approach is in keeping within Government policy and supports the consolidation that is happening within the wider trade union environment."